Like ordinary people, important Russian establishment figures, from the President to his cabinet colleagues, spend their free moments unwinding with hobbies they enjoy; from painting to photography and poetry to judo and white water rafting. 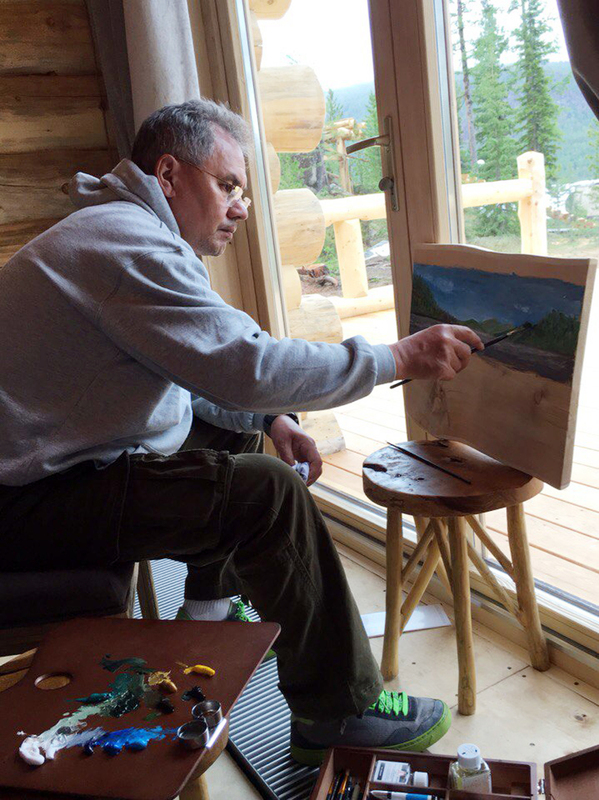 Sholban Kara-ool, Chairman of the government of the Tuva Republic, recently posted photos on his social media account of Defence Minister Sergei Shoygu painting local landscapes in the town of Chadan. As a sports lover, President Vladimir Putin enjoys hockey and skiing, but the president’s greatest passion is for the martial arts. He started practicing sambo and judo at age 11. Now he is not only a master in both, but he is also the honorary president of the European Judo Union. He even received an honorary doctorate in the field of judo from Yong In University in South Korea in 2010. In an interview with the Chinese media on June 24, 2016, Putin spoke of how judo helps him in his life. Putin also enjoys fishing, horse riding and white water rafting. The affable Sergei Lavrov is also a fan of white water sports. Between 2007 and 2009 he was the head of the International Rafting Federation in Russia. The minister has long professed his love of water sports. As a student at the Moscow State Institute of International Affairs (MGIMO) he would often go out on the river with friends in rafts and catamarans. Once a year during his holidays he tries to conquer mountain streams. The waters of the Altai region hold the greatest appeal for him. “I often spend a few days’ holiday in the mountains of the Altai, which helps to put my mind at ease,” Lavrov told the Altai Star newspaper in January 2015. Besides rafting, the minister likes to play guitar and write poetry. When working in New York in 1996, he wrote a poem about an expedition in the Altai Mountains by river, foot and horseback that he had been on with former classmates from university. The diplomat also composed the official song of MGIMO in 1999, which has remained unchanged since then. Dmitri Medvedev has been interested in photography since his days as a Pioneer, the Soviet Union’s equivalent of the Boy Scouts. However, he only took it up seriously “at a more mature age, probably after the age of 30,” he has said. Medvedev posts his photos on Instagram where he has more than two million followers. The Prime Minister also took part in a photography exhibition called The World Through Russian Eyes in 2010, and one of his works was once sold at an auction in St. Petersburg for 51 million rubles ($772,000). Vladislav Surkov writes poetry, music and plays the guitar, according to TASS news agency. Vadim Samoylov, a former member of the rock group Agata Kristi, a hugely popular band in Russia in the 1990s, also spoke of Surkov’s great love for poetry in an interview with Ksenia Sobchak on her show on the Dozhd television channel. Samoylov shared the story of how he developed a “creative friendship” with the famous politician, which resulted in the release of two albums based on Surkov’s poetry: Poluostrov (Peninsula, 2003) and Poluostrov 2 (2006). Irina Khakamada is a former deputy of the State Duma (1993-2003), former joint president of the Union of Right Forces (1999-2003) and a candidate for president of the Russian Federation in the 2004 elections. In her free time, Khakamada, whose father is from Japan, enjoys calligraphy. She has said that she believes there is no better way to take your mind off work than to do something with your own hands. “It seems to me that when you are working with your hands, your consciousness switches itself off, which really does allow you to regain your composure,” she said.